This is another interpretation of the mystery novel of the same name by author Agatha Christie. I don't think I ever finished reading the book but I think I remember seeing the 1974 movie version on the local ABC 4:30 movie show sometime during the seventies. Or maybe it was on a Sunday night. It was a long time ago. In any event the 1974 movie featured a number of movie stars including but not limited to Lauren Bacall, John Gielgud, Sean Connery, Ingrid Bergman, Albert Finney and Anthony Perkins. Because movie stars weren't as over exposed in the media then as they are today I seem to remember being a little more able to disappear into the 1974 film, to go back in time to a day when travel by train could be a serious luxury. The 2017 film can also be considered to have an all star cast but for me it wasn't quite the same. Of course that just may be silly nostalgia on my part. I can barely remember most of the 1974 film. I certainly didn't recall any important plot points or spoilers which is why I was interested in seeing the 2017 version. After watching it I felt even more nostalgic for the 1974 version. The new version was good. It was crisp. I enjoyed the sets, the cinematography, the lighting and occasionally the accents. But I wasn't obsessed in finding out who committed the titular crime or why they had done it. I thought that Branagh, who plays the obsessive compulsive world's greatest detective Hercule Poirot, put too much emphasis on Poirot. It would have helped the storyline and paranoia if we saw things from other passengers' point of view. As with the 1974 version, this movie also has a heavyweight cast which includes Penelope Cruz, Daisy Ridley, Judi Dench, Leslie Odom Jr., Michelle Pfeiffer, William Dafoe, Derek Jacobi, Olivia Colman, Tom Bateman, and Johnny Depp. 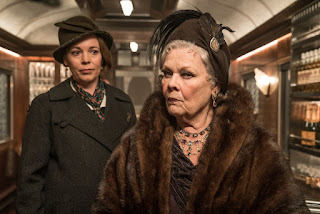 In 1934 Poirot (Branagh) is in British run Jerusalem solving a strange theft from the Church of the Holy Sepulchre and hopefully forestalling religious pogroms. This incident establishes that Poirot is a very intelligent man but also one who is obsessive compulsive and morally rigid. Poirot believes that there is right and there is wrong with nothing in between. Poirot wants his two breakfast boiled eggs to be the same size, exactly. Poirot can't stand neckties that are slightly askew or shoes which aren't buffed to a blinding shine. Poirot craves perfection; he thus has a nose for imperfections such as lies or crimes. Poirot considers this aspect of his personality to be both a blessing and a curse. After Jerusalem, Poirot would like to spend some time relaxing in Istanbul but is summoned to London to solve a murder. The quickest way or at least the most pleasant way home, is to take a train from Istanbul to Calais and then hop on a ferry. And what better train to take than the Orient Express? 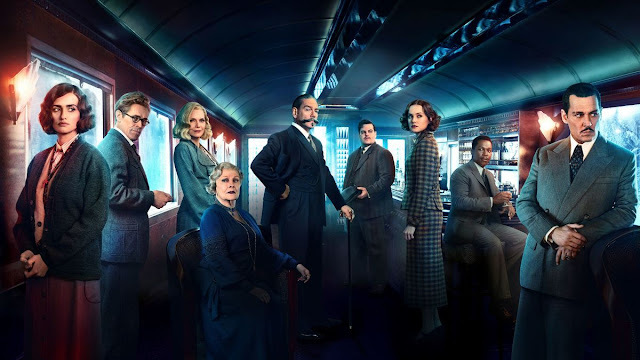 As Poirot has connections he's able to get a compartment on the train though it was fully booked already. There are a number of eccentric characters on Poirot's train car, most of whom don't appear to be too happy to see the detective. One man who is intrigued to see Poirot is Edward Ratchett (Depp), an American "businessman" of questionable morality. Ratchett claims to have enemies everywhere. He wants to hire Poirot to watch his back. Poirot declines. He doesn't do bodyguard work. And even if he did there's something more than unsavory about Ratchett that just rubs Poirot the wrong way. That night Poirot hears some strange noises in the hallway and from Ratchett's room. An avalanche temporarily derails the train. No one is going anywhere. In the morning Poirot discovers that someone has murdered Ratchett. So Poirot is trapped on the train with a murderer. Every passenger on the car is a suspect. Poirot doesn't want to get involved in the case but is convinced to do so because otherwise the authorities may just blame the murder on the nearest minority. But the real reason that Poirot decides to get involved is that he can't resist a puzzle. This kicks off a classic locked room mystery tale. This movie was okay. It was a pleasant interlude, but not a great film. Outside of Ratchett's murder it's not violent. It will appeal to those who don't care for cinematic mayhem. People who like to use their brains to figure things out without having every last single hint fed to them may also enjoy this film. Branagh dominates the film but not in a good way. I kept waiting for his mustache to start moving on its own. The clothing is period appropriate as is much of the dialogue.